[From IMDB:] Three years ago, entomologist Dr. Susan Tyler genetically created an insect to kill cockroaches carrying a virulent disease. Now, the insects are out to destroy their only predator, mankind. This never bugged me back in 1997, but shouldn’t the Deputy Director of the CDC and the woman who designed the breed of cockroach that saved a generation of children have been able to get a bit more support to go hunting for bugs under the city? I mean, I feel like she in particular should have had a bit of influence after what she achieved. This particular issue really bugged me (ho ho ho) throughout my entire rewatching of this movie. It just seemed like too large of a plot hole for someone to not have gone, ‘hey, wait a minute…’ at some stage. Alternatively, it could just be one of many instances of underdevelopment rife in Mimic – not least of which takes the form of a cast of one-dimensional characters, whose primary characteristics could be summed up in a few words each. This makes for a movie that my teenage self might have quite enjoyed (and, in fact, I expected to still enjoy it), but which my current self found, well, less than engaging. And this is a real disappointment, because even with some CGI that hasn’t aged all that well, Mimic is quite a nice looking movie – particularly in terms of its monster designs. It’s even filmed well (which isn’t surprising, given Guillermo del Torro is the director). It just lacks the necessary depth to really bring out its best. 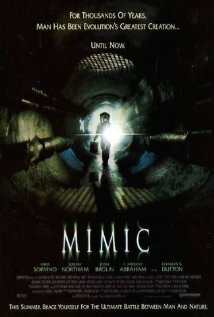 None of this necessarily means that Mimic is a bad movie, of course. Let’s face it: a lack of depth and one-dimensional characters aren’t exactly an unfamiliar feature of the genre (or of movies in general, really). But my teenage self is still a little disappointed that a movie he held in high regard doesn’t still live up to his older self’s standards; even if my older self is glad to know that his standards have apparently developed over the years.